Patriot Company competed in the second drill meet of the season at Federal Way High School. 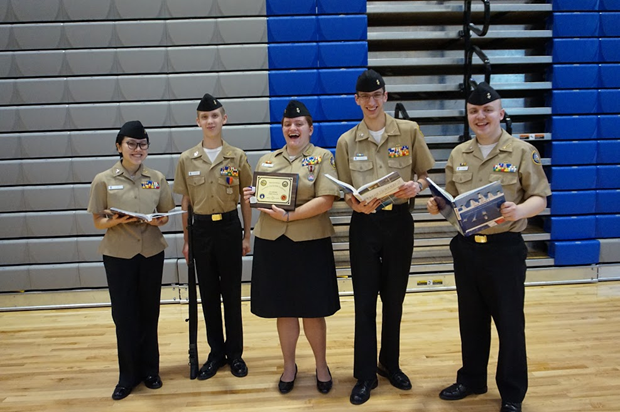 They competed against the following local high school JROTC teams: Graham Kapowsin (Army JRTOC), Kentwood (Marine Corps JROTC), Federal Way (Air Force JROTC), Todd Beamer (Air Force JROTC), Auburn Mountain View (Army JROTC), Bremerton (Navy JROTC), and Spanaway Lake (Navy JROTC). As usual, it was a spirited competition! Overall, Patriot Company had their best drill meet in many years! ColorGuard Team 1 , consisting of Cadets Daniel Tsang (10), Olivia Van Ry (11), Kerrek Matson (12) and Colby Van Ry (9), is inspected by active duty Navy personnel prior to their competition at Federal Way High School. Patriot Company's Unarmed Drill Team, led by Cadet petty Officer First Class Ovsak (10) is inspected by active duty Army, Navy, and Air Force personnel prior to conducting their regulation drill routine. Patriot Company's Armed Drill Team, led by Cadet Lieutenant Commander Chandler Alexander (12), go to Inspection Arms in preparation for being inspected prior to conducting their regulation and exhibition armed drill routine. Naval Science Instructor, Chief Spears, provides a little motivation to Cadet Emily Lew as she struggles to complete more push-ups during the physical fitness competition. Cadet Christian Lamprey (9) strains to complete more sit-ups during the physical fitness competition. Cadet Kaitlin Lew (9) leads Patriot Company's Physical Fitness Team as they complete the mile run portion of the physical fitness competition. Patriot Company's Academics Team, consisting of Cadets Khanh Dao (10), Carson tucker (10), Lenna Weiss (12), Evan Rosenfelt (11), and Jacob Hill (11), show off their award for finishing first in the academics competition. Older PostLiberty's Science Olympiad Team Succeeds!